Anyone who has attended a performance here in Meany Hall knows what to expect: the lights go down; the curtain goes up, and magic happens. But the performers on stage aren’t the only artists at work—there’s a whole other carefully choreographed performance behind the scenes as well that most people never see. The stars of that show are the unsung heroes of Meany: our Tech Crew. The “newest” member of that crew is Matt Starritt—though he could be one of the oldest, as well, depending on how you count his time at Meany. Matt joined us full-time a year ago—but his involvement with Meany goes back more than 14 years to when he was an undergraduate in the Creative Writing Program here at the UW. Though he graduated with a B.F.A. in creative writing in 2005, Matt had always been involved in theater. He was originally interested in a double major, but at the time the UW Drama Department focused more on acting than theater design. So instead, Matt got a job in the scene shop where he learned to build scenery. When the Drama Production Manager, Anne Stewart, discovered he’d acquired experience working with sound during high school, he got put on the sound board for performances. By his third year, Matt was designing many of the shows the department produced. In 2004, several UW Drama graduate and undergraduate students—a mix of actors and designers including Matt—decided to start a theatre company here in Seattle. They founded Washington Theater Ensemble (WET) which is still thriving today in its 15th season! 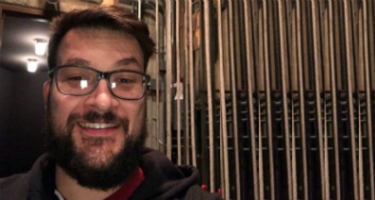 Matt stayed with WET for four seasons before branching out to work as a freelance sound designer at other regional theaters. “I’ve worked for almost every theater, large and small, in Seattle,” Matt says, “as well as some nationally—California, Texas, New York.” Throughout his freelance career, Matt continued to overhire at Meany Center. Then last year he decided to join us full time. One reason he enjoys working at Meany is that the stage crew here is quite versatile. For example, for Compagnie Käfig’s recent performance, Meany hired a sound engineer to replace Matt at the sound board so that Matt could take on Stage Manager Juniper Shuey’s job while Juniper moved over to help with Käfig’s complicated video projections.